Donald Trump picks fast food CEO Andy Puzder for secretary of labor. Andrew Puzder, chief executive of CKE Restaurants, is reported to be Donald Trump’s pick for labor secretary. With his pick for secretary of labor, Donald Trump appears to be extending an enormous symbolic middle finger to fast food workers who have campaigned for a higher minimum wage. The president-elect has reportedly settled on CKE Restaurants CEO Andy Puzder, whose company owns the second-tier burger chains Hardee’s and Carl’s Jr., and is known as a strident critic of regulations that would increase worker pay. Yet, if you are a liberal who has spent most of the Trump transition suffering from existential nausea, there is one very large silver lining here. Puzder may be an affront to organized labor, but he’s also a very eloquent advocate of comprehensive immigration reform. Perhaps he could end up serving as a voice of reason on that issue within the new administration. Puzder donated to Trump’s campaign and served as an adviser on job creation. He’s a frequent op-ed writer and TV guest who, unlike some of his fellow fast food executives, has come out hard against significant minimum wage increases and said that workers asking for $15 per hour “should really think about what they’re doing.” Back in 2014, he complained that California was “artificially” raising the pay floor to $9 an hour and argued that businesses would create more jobs if government would just “get out of the way.” He’s also talked openly about replacing workers with automated ordering kiosks, something his fellow fry-mongers have been more circumspect about. That said, Puzder has offered at least some nuance on the wage issue. “The CBO came out with a report last year that said you could raise the minimum wage to about $9 without much impact to jobs. And you probably could do that,” he said during an interview with Fox Business in May. (The current federal minimum is $7.25 per hour.) But he suggested that if the U.S. were to increase the minimum wage, there should be an exception for entry-level workers and high unemployment regions. States and cities have tried somewhat similar ideas in recent years by varying their minimum wage increase geographically, or exempting teenagers. 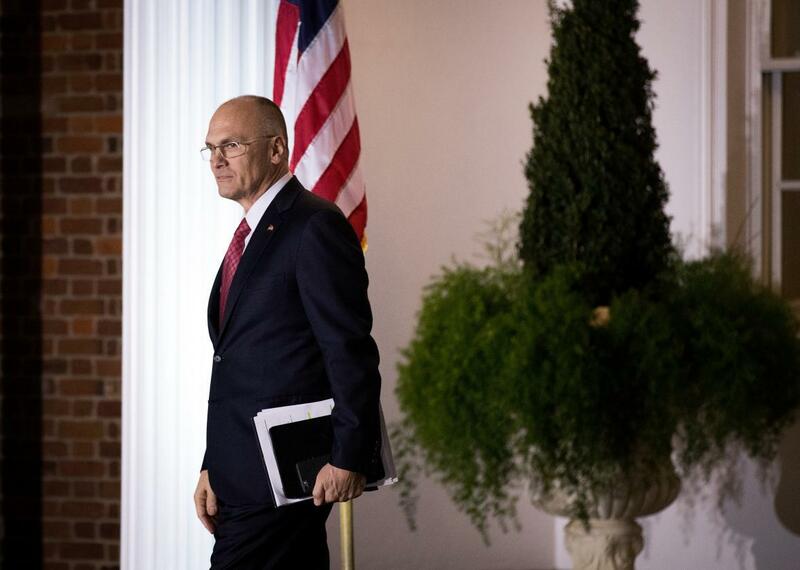 Puzder is also a vocal critic of the Obama administration’s new overtime rules, which would have extended time-and-a-half to more than 4 million American workers. In a Forbes column he argued that the new regulation “devalues this career progression and forces some businesses to turn entry-level management careers with salaries and performance-based bonuses into hourly jobs.” Defenders of the rule might argue that was the whole point, since many retail and fast food businesses were wrongly classifying low-wage workers as managers to avoid paying them overtime. In any event, it seems unlikely that reg will survive Puzder’s tenure. He may not even have to do much to roll it back. In November, a federal judge blocked its implementation, and as Politico notes, it seems unlikely the Trump administration will continue defending the case. If we had immigration reform and were able to hire these people who want to work, we’d have a more diverse, incentivized and productive workforce. We’d have access to not only low-skilled workers in our business but the high skilled workers that everybody talks about. You’d have consumption from these individuals, because obviously if they’re working and they’re making money and supporting their families they’d be out there buying things. You’d really reinforce the idea that the United States is the land of opportunity, the land of entrepreneurial vision. And that could use some reinforcing. And lastly, it would remind all of us that our freedoms and our liberties shouldn’t be taken for granted. We’re actually a country that was founded on the principle that god gave us the right to pursue happiness. And there are very few nations in the world, if any, that were founded on the principle that god gave you the right to pursue happiness for yourself and your family. That’s been a beacon for immigrants for years. That’s why there are 11 million people who came here illegally. They not only came here because they could get jobs but because they could pursue that goal of fulfillment and satisfaction for themselves and their families and their children going forward. So I think this bill, and I know that’s a lot of indirect ways it effects our business and some direct ways but I think a bill like the bill that’s before Congress now could really be a benefit to the United States. Not only because the CBO says that it would be productive to GNP, our gross national product, and reduce the deficit, but because it’s the right thing to do, it’s the country that we are, it’s the people that we are, and we need to foster that image across the world and in the United States. During the same event, he praised immigrants’ work ethic and suggested the whole country might be a little better off if it looked more like California. Yes, most on the left are going to bristle at the idea that workers should be grateful for mere employment. But complimenting the industriousness of your Mexican employees is a tad preferable to describing them as rapists. Practically speaking, Puzder could have some direct effect on policy here, since the Labor Department works with the Department of Homeland Security on workplace immigration enforcement. Perhaps more importantly, though, it looks like Donald Trump might have an actual advocate for comprehensive immigration reform, one who’s against mass deportations, whispering in his ear. Considering that another leading candidate for labor secretary was apparently an immigration hawk, that’s good news. So Puzder’s presence in the administration may be an insult to the Fight for $15. But he’s still an above-replacement addition to Trump’s Cabinet, at least for those of us hoping to see the incoming White House inflict minimal damage on the country. After all, most Republicans are bad on labor. Paul Ryan isn’t going to pass a major minimum wage increase. Almost any GOP-er would deep-six Obama’s overtime rule. And Trump himself just spent a night intimidating a steel union member on Twitter. At least this guy might restrain the president-elect’s worst impulses when he’s debating whether to banish human beings en masse from the country. Or maybe he could pull off an even more amazing feat. One can almost imagine a scenario where Puzder and Paul Ryan cajole Trump into a Nixon-to-China moment on immigration reform, where in return for building his giant, utterly unnecessary wall and funding more border agents, Trump signs off on some sort of path to legal status for the undocumented. Probable? Of course not. But possible? Just maybe. *Update, Dec. 9, 2016: The words “would ease up” were originally erroneously omitted from this sentence.